2012 Raku Workshop - Valley Potters Inc.
Once again the weather leading up to this event thwarted plans for a Teepee firing, maybe next year perhaps. the rain held off for the workshop, but the ground was too sodden for a teepee firing. We took the option of glazing and firing in the carport of Laura's shed and only venturing into the cold for the reduction part of the process. there were a variety of glazes to choose from, including two mystery glazes. Laura later "fessed" up and said they were commercial earthenware glazes from Potters Equipment. The Flame and Lime glazes gave excellent results, and as with all Raku glazes the effects were different on all pots. It was a busy day, glazing. drying pots and only one large piece missed being fired. Kilnmasters Laura and Raine had a great system going with pots being dried in the Pot-a-Kiln and on top of the wood heater in the shed. This meant there were no big explosions of pots with damp glaze. Valley Potters as always put on a great spread for lunch, pumpkin soup and pea and ham soup from Laura and Olga, and rolls bread cakes etc provided by others. Olga, our ever efficient Workshops officer arrived early and set up the tea and coffee station and we were ready to work our socks off. A great fun day was had by all. 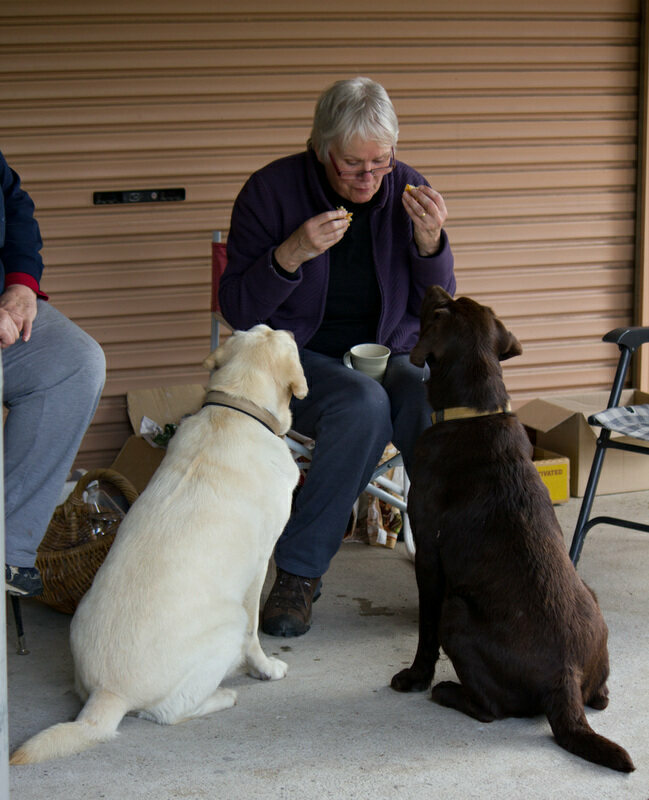 Riley and Flynn the ever hungry labradors, were exhausted with al the activity and the hard work begging morsels of food for everyone.